Our beautiful pool at the Alila resort! Bali was never on my travel wish list, well not until recently that is. It wasn’t until my sisters raved on about how amazing it was that I decided I had to check it out. Okay so maybe the book (and now movie), ‘Eat, Pray, Love’ had something to do with it too! And boy, were they right! Bali was absolutely amazing! Our first stop was Nusa Dua (read all about it here), next it was Ubud! Ubud is situated in the middle of the island and is surrounded by lush rice fields and mountains, and is the heart of the fine arts and culture of Bali. WOW what a place! It is picturesque and peaceful, a breath of fresh air from city living, a place to really unwind and escape. 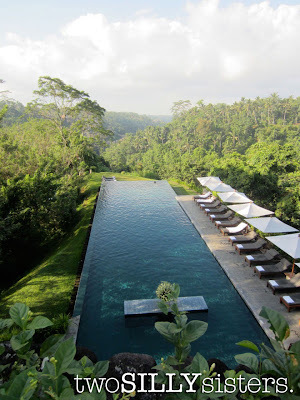 We started our Ubud experience at the gorgeous Alila resort, which overlooks the lush mountains and villages of Ubud, and has been voted as one of the top 50 most beautiful swimming pools in the world. During sunset the monkeys entertained us by coming down from the trees to play. The Alila was very accommodating to my gluten free needs, by supplying bread and even hosting a traditional Balinese banquet dinner on our first night all made gluten free! Our traditional Balinese banquet dinner made gluten free just for me! If you are headed to Ubud town, Café Wayan is a great spot for lunch as the tables are outside and surrounded by luscious green gardens. They were very helpful with my gluten free requests, but I’m glad I had my translation card with me as they came in handy. Once the chef had read it, they were very helpful and I ate a beautiful chicken and potato curry served with brown rice. 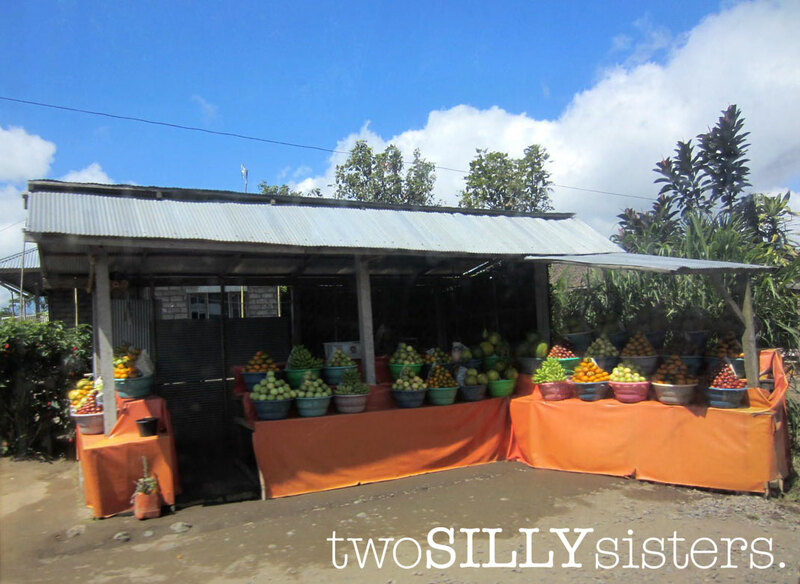 The fresh juice combinations we had in Bali were delicious. It’s very rare you will find just the standard apple or orange juice. Here you will find gorgeous juices, such as paypaya, mango, watermelon, rockmelon, and then exotic mixes of juices. When in Ubud, be sure to do the touristy things like visiting the volcano and many rice fields. 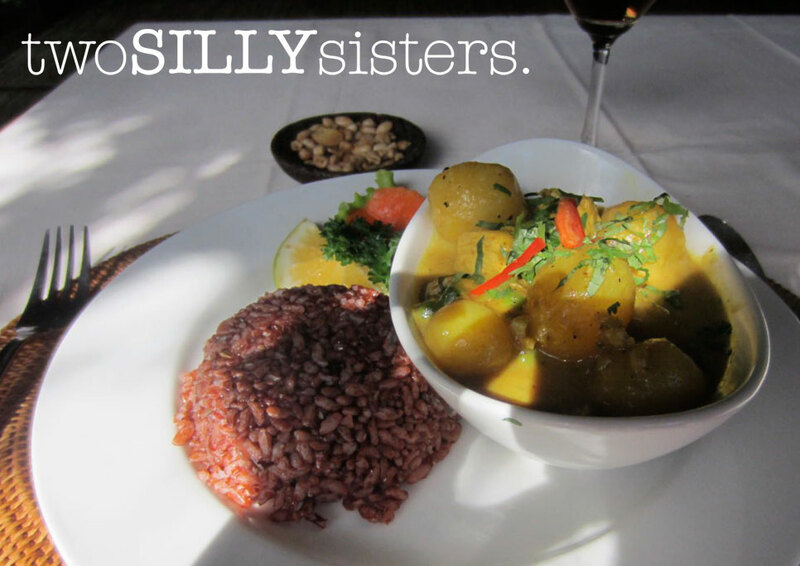 Trust me, the next time you pile up a big serve of rice in your plate, you will appreciate it more! 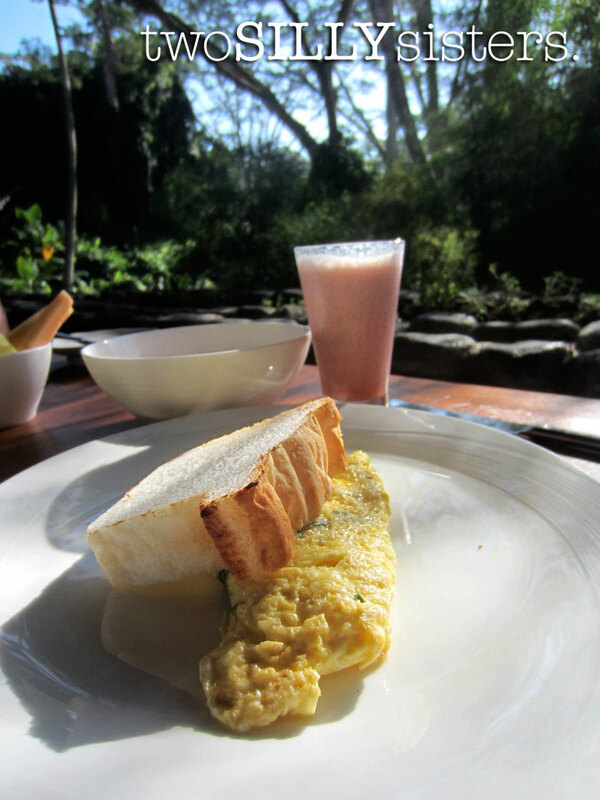 You can also visit the plantations where they grow and make tea and coffee. You may even be given the opportunity to sample these (and of course buy some) however be careful of the Kopi Luwak coffee! This is a special and very expensive coffee. 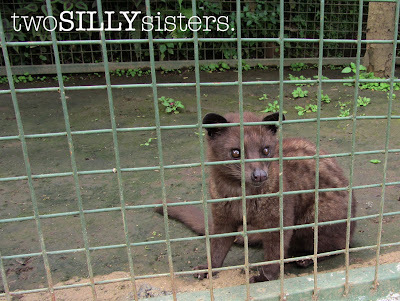 A little animal, called an Asian Palm Civet, is bred to eat coffee berries. The animal then passes these berries and this is processed to make coffee. Yep… coffee made from the animals pooh! I think I’ll pass!!! 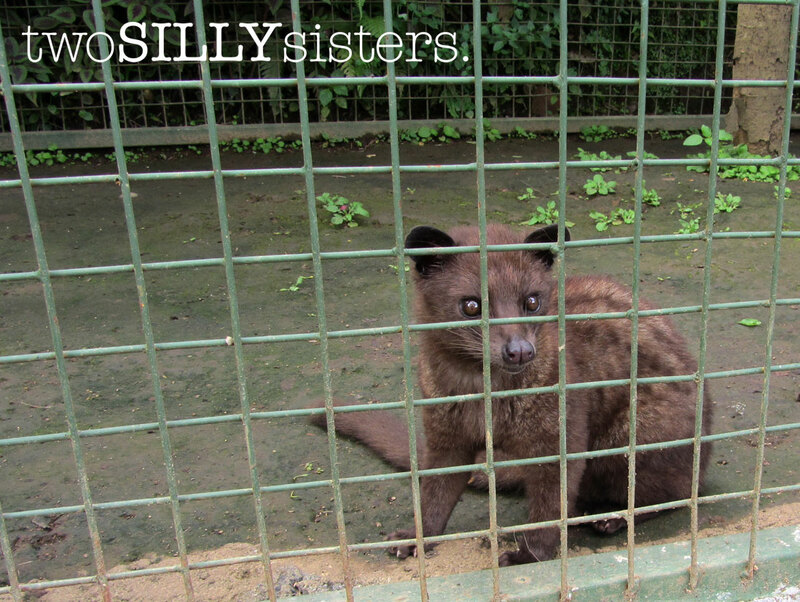 Kopi Luwak coffee is made from this little guys pooh! The majority of the Balinese population are Hindu. They honour the gods and ancestors and pray many times a day. You will see these offerings on the streets of Bali. These are gifts to the gods, and are a way to present their gratitude. Palm leaf trays are prepared, containing flowers and some form of offering as a token of thanks. Some of these offerings include rice, fruit, meat, or as witnessed by myself, cigarettes. Be careful not to step on these, as this is considered very disrespectful to the Balinese people. Fresh coconut picked straight from the tree! The highlight of my Ubud trip was a 3-hour walking tour. It started off very calm and easy, walking through the villages and meeting locals, seeing where people live and how and where they work. 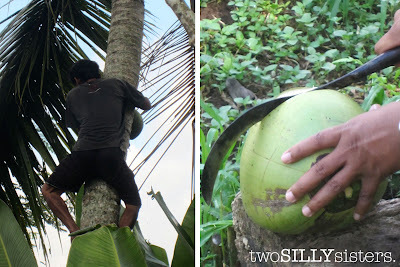 I even had a village man climb a coconut tree for me and bring me down a coconut. He then cracked it open and I drank the juice and ate the flesh. Now you can’t get much fresher than that! Then the walk turned into more of a mountain trek, as we journeyed through the rice fields, I prayed to god that I would return home that day! My heart was beating so fast and I honestly thought this was it! The trek we took wasn’t a man made path. Yes there was steps made in the dirt but this was from where other people had walked. Walking down paths, which didn’t even resemble a path until the instructor pushed aside the shrubs. However, we were in good hands and our instructor was very patient with my slow steps! We climbed rocks and walked down steep slippery tracks, our shoes (and bodies!) covered in mud by the end of the trek. Had I known what this trek involved I probably would not have done it. But I am so proud of myself for getting through it! I really pushed my limits and although my muscles ached for days, it just goes to show that you can do anything you put your mind to! When asking the locals which restaurant were the best in Ubud, you will more than likely hear them talking about Indus restaurant. We decided to test this one out and we were not disappointed. You will be amazed from the very minute you enter the restaurant. The setting is beautiful, the service fantastic and the food absolutely delicious! And most importantly I mentioned gluten free and they knew exactly what I was talking about! Almost everything could be made gluten free, but be sure to ask your waitperson on the night. For entrée I ordered seared scallops on a bed of mash potatoes and rocket salad, main was a Balinese style paella, and dessert coconut crème caramel. All the food was delicious and the service was 5 star quality! The stand out dish of the night would have to be the Balinese paella. 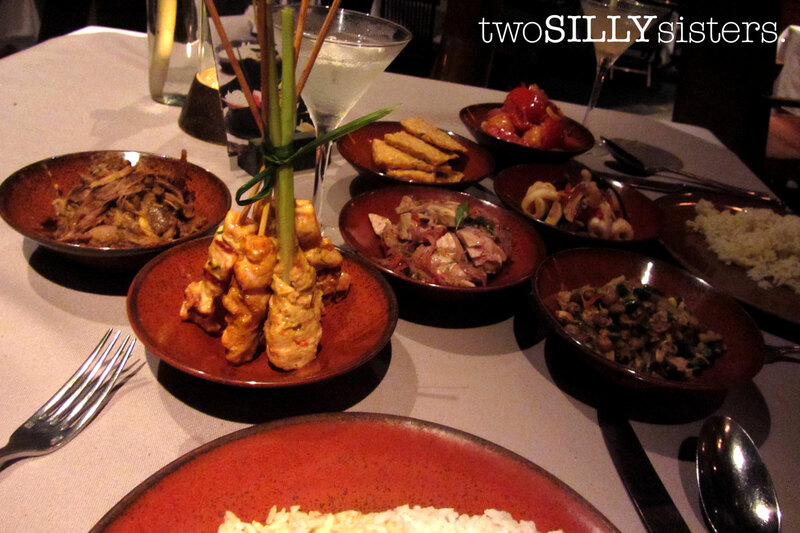 The flavours were just amazing… I can’t even begin to describe them! All of this and two cocktails set us back about $50 including tip! For those who are used to $5 meals in Bali this may seem expensive, but when you are looking at the quality of dining, this is peanuts, in comparison to what you would pay in Australia! The amazing 3 course dinner eaten at Indus restaurant! Here’s a list of places I recommend when visiting Ubud, Bali. Well that’s the end of my Ubud blog. I hope you enjoyed reading it as much as I enjoyed writing about my travels. Ubud is truly beautiful and possibly my highlight of Bali. Next week, we will journey to my third and final stop, Seminyak! This is fantastic!! Thank you so much for writing this blog. I am a coeliac and on my way to Bali next week. Your blog will come in very handy. Thanks again!!! Hi, I am a coeliac and have just discovered your blog - it is brilliant, well done and thank you! 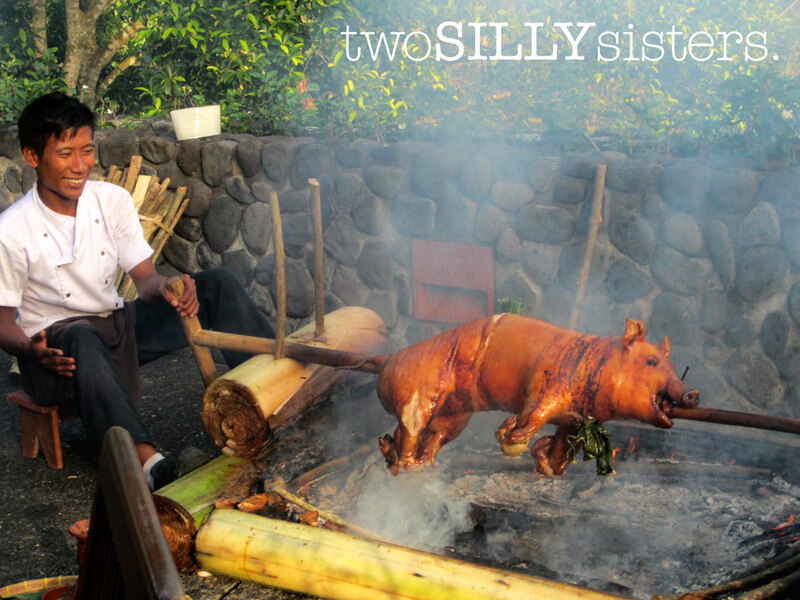 We are currently planning a trip to Ubud and your advice on places to eat is fantastic. We are looking at staying in one of the villas at Alila resort - would you recommend one over the others? The Terrace Tree Villas look amazing but are they worth the extra $? Thanks again for all the great tips and tricks. visit www.sehatindonesia.com: click "seputar alergi" section and print out "Tabel Petunjuk Masakan Bebas Gluten" (gluten free cooking guide) for coeliacs travelling in Indonesia. The place is damn beautiful and the view is just breathtaking. The food looks yummy. Wow wow, thats a great dish. I like your photos. It looks like you both experienced culinary connoisseurs. Your choice is really unique and interesting. But you know banhwa Ubud offers many interesting culinary locations. Hmmm, you should seek out the more for this. nice share. please visit: http://www.balivillaubud.com/restaurant/ ... nice share.